Looking for a cute Mother’s Day gift that is extra special for your mom? 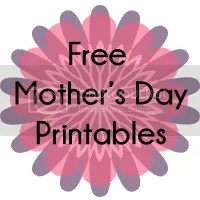 Check out these free Mother’s Day printables! This beautiful Mother’s Day poem will make any mom smile, especially if presented in a handmade picture frame. Mom does so much for us every day so why not do something special for her? These adorable coupons are a great gift to give to your mom. Fill them in with whatever chores or other activities that you think mom would need a break from and let her redeem them at her leisure. I hope you enjoy these printables. If you would like to download the PDF versions, just click on the images above! Very pretty! Thanks for linking up at One Organic Mama! Hope to see you back on Thursday morning! These are such cute printables!! Love them! Thanks so much for inviting me over! I am your newest follower! These coupons are so cute! I'll have to point my hubby over here as a hint to him! Thanks for linking up at Whatever Goes Wednesday! I love printables! This ones are fantastic! Thank you so much for Linking up to Fluster's Creative Muster Party! How sweet are these! What a great for a coupon book! Thank you for sharing! I’d love to have you visit me at Get Your Crap Together! We have a Pattern Party from the 1st of the month to the 10th and would love you to check it out. See you soon!